Yesterday, under grey skies and wind unusual for 8 am in Sunset Beach, four other divers, the boat captain and I headed for Catalina Island. Three to five foot swells and wind chop treated us to an interesting crossing ride and gave me a decent bout of seasickness along the way. Given the less than ideal marine forecast, I anticipated less than ideal underwater visibility and opted for macro photography (for at least the first dive). When you are shooting macro photography, generally that means you are taking photographs of small marine life or you are shooting very close to your subject to capture the fine details of your subject. When shooting macro off Catalina Island, you have a wide variety of marine life and even substrate to focus your camera on. Nudibranchs are popular macro photography subjects. Nudibranchs are shell-less gastropods, commonly mistaken for sea slugs that come in a wide variety of shapes, colors and sizes ranging from the size of grain of rice up to 12 inches, but I have never seen one larger than 3-4 inches in So Cal. Catalina is home to a wide variety of nudibranchs, which are very photogenic with their bright, varying colors and slow movements, making a photograph fairly easy to capture. There are also a wide variety of small fish, invertebrates such as colorful sea stars, and algae that make good photography subjects. Even kelp can be fun to photograph with a macro lens, when focusing on the small critters that live on its stipes and blades and the kelp structure itself also makes for nice artistic abstracts. We were pleasantly surprised by our conditions throughout the day, given the rough crossing, and the sun even came out burning off the grey, marine layer before we began our first dive. We started at site infrequently visited by divers known as the Eagle’s Nest. Many dive sites have names that have no obvious origin, making me wonder sometimes how sites become commonly referred to among the local dive boat operators and local residents. However, there was no mystery with this site’s name, as we spotted a nice-sized bald eagle resting on the side of the hill about 40 feet above the water where we were about to jump in. Our captain also pointed out a large nest residing on the edge of the ridge further up the hillside. This nest has a web camera filming 24-7, so you can actually see the nesting activities online. Eagle’s Nest did not disappoint. Conditions were better than expected, with visibility better in the shallows than at depth, ranging from 30-50 feet. 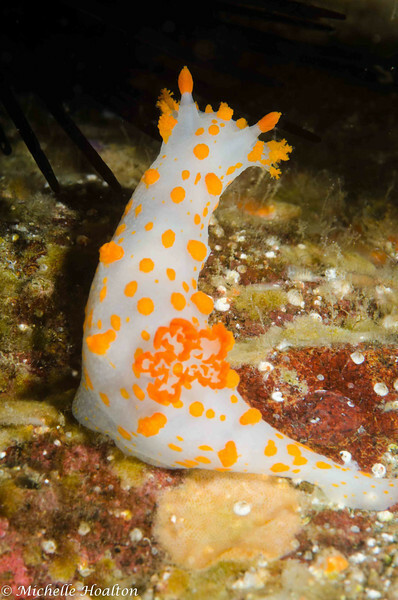 Several species of nudibranchs were present, including the Felimida macfarlandi, Flabellina iodinea, Hermissenda crassicornis and the Triopha catalinae. 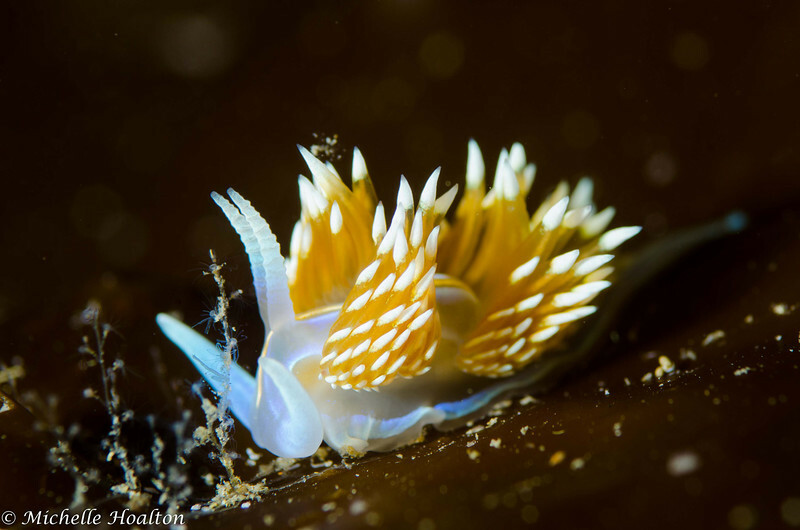 The Tylodina fungina was also seen and is commonly mistaken for a nudibranch, but it in fact has a shell, unlike nudibranchs, but it is an opisthobranch like the nudibranch. This site was also rich in abundance of rock fish, but since I was shooting macro, I only got a lot of fish eyeball shots. Nudibranchs are generally found most abundantly during the spring due to the cooler water temperatures. Today, water temperatures were quite comfortable for this time of year, ranging from 56 degrees at depth to 62 degrees at some of the shallower sites. 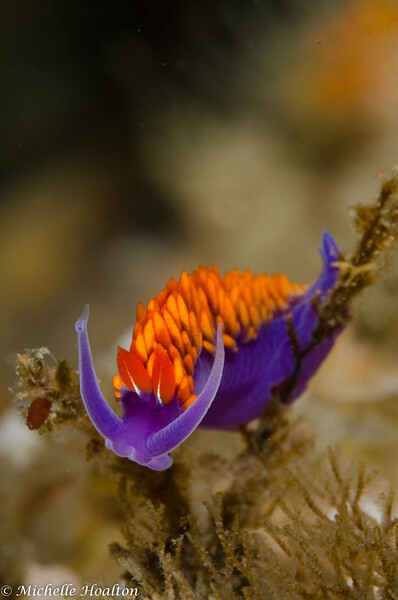 The Hermissenda and the Flabellina (commonly known as the Spanish Shawl) are the most common nudibranchs I see in Catalina, but they make great photography subjects given their bright colors and dramatic displays as they are munching on various foods on the reef. The second site we visited was Big Geiger, a commonly visited site by divers, but one I have not been to recently. 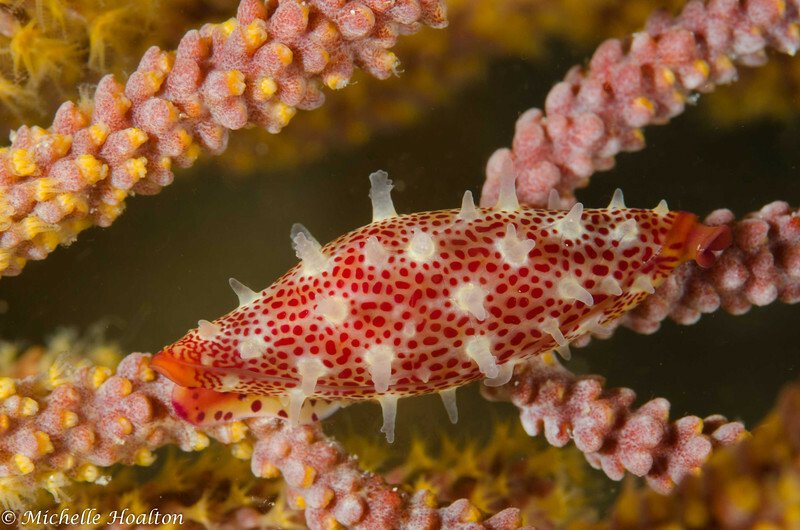 I spent a good portion of this dive photographing a one inch long simnia, a colorful shelled-snail that is frequently found on gorgonian sea fans. This one was found on a golden gorgonian. 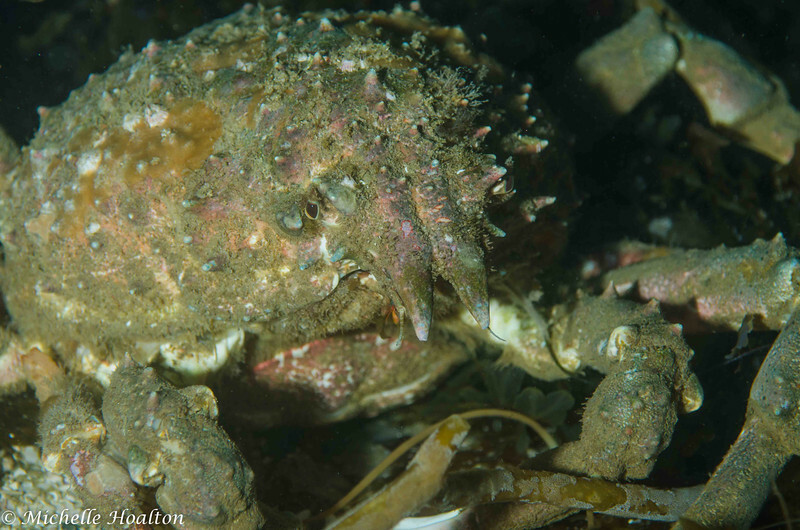 This site also had several sheep crabs crawling around the laminaria-rich sandy bottom. Laminaria is a common algae found in Catalina, which has long leaf-like blades which create nice coverage camouflaging a wide variety of marine life including the sheep crab. The sheep crab is a large crab (I often see them exceeding two feet in length when accounting for their large legs) and they stand up on their hind legs when threatened. I expect they would not hesitate to attack me with their large claws if I approached too closely. I have probably come a little too close for comfort before, but fortunately, I have a large camera set-up to protect me. Our last dive of the day was at Kroll’s. I have been to this location two other times this year and the first time I found a crack in a rock that became the residence to two moray eels completely surrounded by cleaner shrimp. There were so many shrimp that they were pouring out of the crevice. I went to this spot again after spending a few minutes searching around the sand for mantis shrimp since we had seen them both times I was previously there, but no luck this time. I found one of the two eels in the crevice and far fewer cleaner shrimp. In place of the second eel was a lobster facing the side. 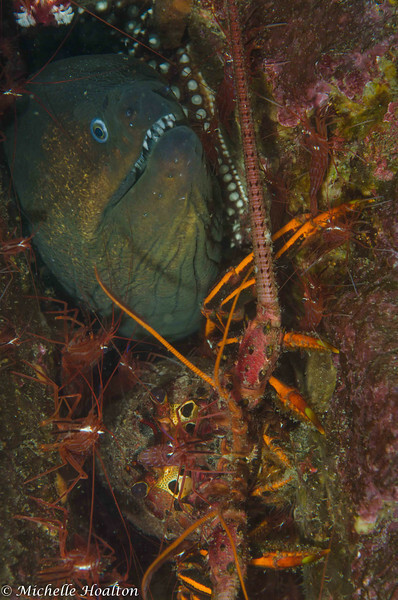 It was awfully cramped in that den, so I can’t imagine that the eel and lobster were very comfortable, but I have been told that it is common to see these two species inhabit the same den for some reason (I’m guessing for mutual protection and feeding benefits).